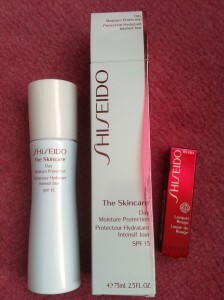 As a self confessed beauty freak, I was really looking forward to visiting the new Shiseido counter at Harvey Nichols in Manchester earlier this month, as although I have heard lots about the brand, I am an actual Shiseido product virgin! I knew the brand had been going strong for a long time and that they have a brilliant reputation in the beauty industry, but that was where my knowledge stopped. So I headed down and was greeted by the lovely Victoria who works for the brand, a of course a nice glass of sparkling champagne! Harvey Nichols beauty department is getting better and better – the new Bobbi Brown and Laura Mercier counters at the entrance of the store pave way for the fantastic brands on the ground floor. Shiseido now sits quite centrally near the escalators (if your familiar with the store) and boasts an extensive range of skincare and cosmetics. The shiny new concession looks great! 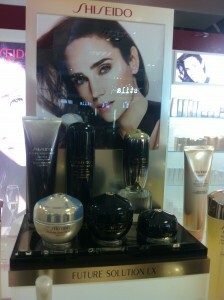 Victoria took me over to a fabulous machine that Shiseido counters work with to fully indicate your skin types and what product ranges you ideally should be using to target any skin problems. I have fairly combination skin – if I don’t use any products it can be quite oily, therefore I use products that can be quite drying to rid of any excess oil and keep my skin looking matte. 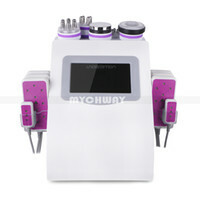 However, after years of following this skincare regime, the machine actually shown that the skin on my cheek is really dehydrated! I was really shocked – so I was shown a close up, in-depth photograph of my skin compared to images of how the ideal skin should look, and I could see just how dry it had become! Luckily, the wrinkle tests proved that on that front I have nothing to worry about. Which at 26 is quite nice to know! I was then shown around all the different skincare ranges and was talked through the range suited to my skin, which would really tackle the dehydration. The range I was particually interested in looking into is called ‘The Skincare’ range – which has a light yet creamy texture to really nourish and hydrate skin. I was advised to perhaps use the moisturising cream at night first, as I still have to control oil with having slightly combination skin. 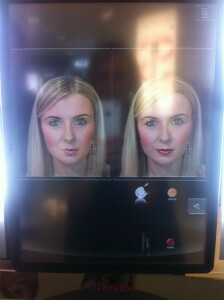 I was then taken to a wonderful little machine called the ‘Magic Mirror’ which takes a photograph of your face, so you can then play around with the palettes of eyeshadow colours, lipsticks and blushers! 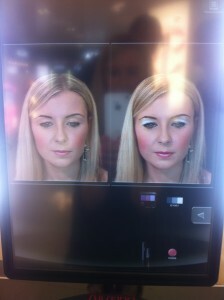 Ever wondered what you would look like with brighter or darker eyeshadow shades but don’t dare try them? Then this is a perfect little electronic mirror for you! I had so much fun ‘wearing’ dark red lip glosses and trying eye colours such as a shimmery greens. The Shiseido counters only have the one mirror so it travels around the country visiting all the concessions in different cities. I most certainly want to use it again! How fab would it be if you owned one in your bedroom!? So to round up my experience at the Shiseido counter at Harvey Nichols, I would say that it was really informative, interesting and fun! I learnt about the natural side and the scientific side of the brand, I learnt about all the product ranges and all the make-up lines, and more importantly, I had an insight to my skin type up close on a camera and then played around with virtual makeovers!